The mission here at the Logistics/Supply Chain section is to strive to do with supply chain what Stephen Jay Gould* did with evolutionary biology. After immersing myself in a Gould essay, I’m able to strut around and claim I understand how the evolution of the modern horse means that Major League Baseball hitters have gotten better since Ted Williams’ day. A Logistics/Supply Chain article should – ideally – do something similar for you. I know that most of you don’t have the time (or the inclination) to commit the 10,000 hours of dedicated supply chain practice that’s needed to become an expert at optimizing inventory, cost of goods, and customer delivery. That’s why you have a supply chain manager or a supply chain team or Wikipedia. But the lessons learned in a Logistics/Supply Chain article should give you the confidence to walk down to your supply chain department and bark about cycle counting or re-order points. If Gould could use the Diet of Worms and the Defenestration of Prague to simplify history, tolerance, and paleontology – I ought to be able to unwind the complexities of supply chain using nothing more than a peanut butter and jelly sandwich. To begin your appreciation of supply chain, let’s start with the PB&J’s BOM. The Bill of Materials is exactly what it sounds like. It’s a list (i.e. “bill”) of all the materials that make up your product. The way cool thing that we supply chain pro’s like about the BOM is that it’s one of those acronyms you sound out. BOM is pronounced “bom” – as in, “you dropped a BOM on me” and “you da BOM.” You can see how much fun we have in the supply chain. If you build Chevrolet’s for a living, your BOM is the ~200,000 components that make up that Cruze. If Viagra manufacturing is your thing, your BOM is the sildenafil citrate (100 mg), some excipients, binding material, a plastic bottle, a cotton ball, and a foil seal. For the PB&J, your BOM is Bread, sliced, 2 each; jelly, 2.5 heaping tablespoons; peanut butter, 2 heaping tablespoons. So, when you’re ready for production to commence, it’ll take you 2 minutes and 20 seconds to deliver that PB&J to your customer. But we’re getting way ahead of ourselves. To give this supply chain case study some urgency, let’s give an example of real-life customer demand. Say your 10-year-old is having three friends over on Saturday afternoon. Today’s Thursday and they’ve placed their lunch order already – four PB&J’s. That’s your customer fulfillment requirement. Can your supply chain meet your customer demand (what your customer wants when they want it)? Let’s peer deep into your supply chain to see. Far, far away – just beyond the quasars of your immediate supply chain – are your Tier II suppliers. Think Welch’s, Wonder and Skippy. These are the suppliers who supply your suppliers. Your suppliers are the grocery stores, and they get their jelly, bread and peanut butter from your Tier II suppliers. You might think that you don’t have any leverage over them, but think about what Trader Joe’s and Costco have done to your Tier II suppliers. Consumers made the Trader Joe’s and Kirkland brands cool – or, if not cool, profitable. Trader Joe’s and Costco vertically integrated, and consumer’s rewarded their ability to make quality products more affordable – and they did it by replacing your Tier II suppliers with themselves. While – in the course of readying those four PB&J’s for Saturday – it may not be feasible to contact Wonder Bread to drive your cost of goods down, working with your Tier II suppliers to negotiate raw material costs, reserve production capacity, and smoothing out any kinks between them and your suppliers is fair game. Your Safeway is across town. It’s reasonably priced and stocks everything from generic grape jelly to 12-grain bread. Your Whole Foods is down the street. That smooth, artisan peanut butter you like so much can only be mortgaged there. And therein lies the supply chain dilemma. Cost, quality, lead-time – optimized supply chain is a function of those three things. It takes longer to procure the less expensive component. The quality components come with a cost premium. What is the goal of optimizing your supply chain? To keep costs down? To shrink cycle times? To reduce the cost of quality? In this case, the 10-year-olds who’ve ordered four PB&J’s for Saturday delivery haven’t spec'd in artisan peanut butter – so the Skippy from Safeway will do. Logistics and supply chain are not the same things. Logistics is the management of the flow of goods. It’s the mode of transport, the cost of transport and the why of transport – as in “Why did you ship 5,000 titanium golf club heads by air?” (Air freighting heavy things is fast but very expensive.) Logistics is a subset of a supply chain, just like procurement is a subset of a supply chain. Managing logistics is making sure you’ve got gas in the car and enough time to get to Safeway, in case you need to replenish. If you’re buying your P, B or J from Safeway or Whole Foods, your Incoterms are “ex-works” since you’re taking ownership at your supplier’s facility. Incoterms are International Commercial Terms – and there are lots of them. If you’re buying your peanut butter from Amazon, your Incoterms are DAP (delivered at place). If you end up buying your jelly from a supplier in Pudong (to reduce cost of goods), your Incoterms might be FOB Shanghai (which means freight on board, which means your supplier pays to put it on a plane or ship buy you pay the freight costs, which means the 35% you saved by buying the jelly in China is more than offset by your freight costs, unless you bought 10,000 jars of jelly). 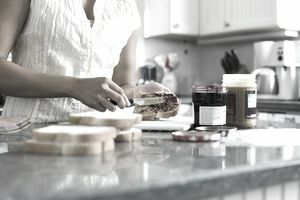 You have 3 warehouse locations in your kitchen – pantry (peanut butter), climate control (jelly) and countertop (bread). For ease of inventory accuracy, you can co-locate all three components in the climate control location, but this is your high-cost location. To optimize your pick-and-pack operation, you can pre-set your PB&J ingredients in your assembly area (kitchen table) to create a workflow. But because of the perishable nature of your ingredients, you can only stage your components shortly before work is scheduled to begin. Like the good supply chain manager you are, you cycle count your ingredients the night before. Eight slices of bread. Three-quarters of a jar of jelly. And a brand new jar of Skippy. You’re all set. Safety stocks and reorder points are not the same thing – unless they are. Some people treat them like the same thing, and sometimes your reorder point might be at your safety stock level – but that doesn’t make them the same thing. Safety stock is the amount you keep to cover for un-forecasted demand or other spikes in demand or supply lapses. Let’s say you know you have to buy more of your artisanal peanut butter when you get down to a half jar – the half jar is your reorder point. Let’s say that when you get to Whole Foods, they’re out of stock, but they’ll have more in a week. Your 7-year-old daughter has to bring snacks for her Saturday AM soccer game. She decides to make PB&J quarters and drops your jelly inventory below its reorder point. And she depletes your bread inventory. It’s now less than an hour until you need to deliver your 4 PB&J’s. You calculate that you have enough peanut butter available, and you can use up your jelly safety stock – but you need to replenish your bread. You’ve already calculated that you’ll need 9 minutes and 20 seconds to make the sandwiches. A trip to Safeway (and back) will be 30 minutes. But a trip to Whole Foods (and back) is only 12 minutes. There’s a cost premium to buying the Whole Foods bread, but your priority now is lead-time. 12 minutes later, you’re back in your kitchen. You pick your ingredients and begin the production process. And 9:20 later, your customer’s receive what they want, when they want it. To those in the supply chain trenches, this is their job – to ensure that customers get what they want when they want it – to have the inventory on hand, but not too much of it – and to accomplish that using data that’s generally unreliable. Optimizing your supply chain means building in the processes that can predict that unreliability and manage your costs and deliver on time. Now, go forth and impress your friends and co-workers. You know as much about supply chain as I do about evolutionary biology. *In 2002, when Gould died of his second attack of cancer, I heard the news on NPR. I pulled my car over and wept. I devoured the man’s essays and books. Please find his writing and read it. He’ll teach you about punctuated equilibrium and educate you and confound you and challenge you like a great writer should. Plus, he played himself on The Simpsons.